LONDON, England (CNN) -- The Church of England is offering unmarried parents who want to tie the knot the option of having baptisms for their children at the same time. 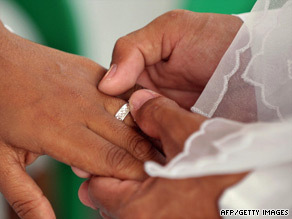 Statistics show an increasing number of couples live together before their wedding day, the church says. The offer is a response to demand after church-sponsored research showed that 20 percent of couples getting married in a church already had children, whether together or from a previous relationship, the church said. It is also a way to make the church more welcoming for unmarried parents and their families, a church spokesman said. The church is issuing new guidelines to priests that encourage them to offer parents the option of having a baptism or thanksgiving service for their child's birth at the same time as their wedding. The guidelines also advise priests on how to perform the dual ceremonies, the spokesman said. "Patterns of relationship and marriage within society are presenting new opportunities for the church," said Bishop of Wakefield, Stephen Platten, who chairs the Church of England's Liturgical Commission. It has always been possible to hold both ceremonies at the same time, but priests didn't always know how to go about it, spokesman Howard Dobson said. The guidelines make it easier for priests to know how to offer and perform the dual ceremonies, he said. Research from Britain's Office of National Statistics shows that for many couples, having children is now the first major milestone of adult life, ahead of marriage -- in contrast to their parents' generation, the church said. Statistics also show an increasing number of couples now live together before their wedding day, the church said. The Church of England said it hopes the ideas "will help churches show their welcome for couples with children, and give the whole family a special occasion and a new beginning."